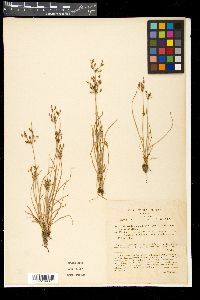 Fimbristylis annua (All.) Roem. & Schult. Plants annual, cespitose, 5-50 cm, base soft; rhizomes absent. Leaves nearly distichous, 1/2 to equal length of culms; sheaths bristly ciliate apically, backs glabrous or hirtellous; ligule present, complete; blades narrowly linear, 1-1.5(-2) mm wide, flat to shallowly involute, margins ciliate-scabrid, adaxial and abaxial surfaces glabrous or pubescent. Inflorescences: anthelae simple or compound, mostly open, diffuse, ascending-branched, longer than broad; scapes slender, 1 mm thick, angular; proximalmost involucral bract longer or shorter than anthela. Spikelets tan to brown or red brown, ovoid to lance-ovoid, 3-8 mm; fertile scales broadly oblong to ovate, 2 mm, acute to obtuse-angled, smooth, midrib reaching apex or excurrent as mucro. Flowers: stamens 1(-2); styles 2-fid, flat, fimbriate. Achenes white to brown, often iridescent, lenticular or obovoid to pyriform-obovoid, 1 mm, cancellate, with 5-12 longitudinal ribs per side, alternating with as many rows of horizontally rectangular pits; warts of achene more usually distributed, or achene (rarely) smooth. 2n = 30. Fruiting summer-fall, all year southward. Various moist to wet substrates, often on exposed, recently disturbed soils around or in shallow temporary pools in outcrops, in savannas, fields, and paddies; 0-1000 m; Ala., Ariz., Ark., Del., D.C., Fla., Ga., Ill., Ind., Kans., Ky., La., Md., Mich., Miss., Mo., N.J., N.Y., N.C., Ohio, Okla., Pa., S.C., Tenn., Tex., Va.; Mexico; West Indies; Bermuda; Central America; South America; Eurasia; Africa; Atlantic Islands; Indian Ocean Islands; Pacific Islands; Australia. The extensive, yet incomplete, synonymy above partly illustrates the polymorphic nature of Fimbristylis annua, there being many 'stabilized' morphs in specialized habitats and much exchange of achenes mixed with grass seeds (particularly rice). Clustered annual to 3(-5) dm; lvs narrowly linear, 1-2(-4) mm wide, glabrous to tomentose; ligule a line of short hairs; spikelets 3-8 mm, lance-ovoid or oblong, few-many in a simple or compound system of umbelliform cymes; scales broadly oblong to ovate, smooth, only seldom shortly excurrent-mucronate; stamens 1 or 2; anthers 1 mm; style bifid, fimbriate from near the base to the branch-point; achene lenticular, plump, obovate, 1 mm, rather coarsely cellular-reticulate in vertical rows, sometimes warty; 2n=30. Moist, sunny, sometimes disturbed sites; widespread in trop. and warm-temp. regions, n. in U.S. to Del., Pa., and Mo. Often included in the mainly tropical, coarser perennial F. dichotoma (L.) Vahl.